The bridge has a clear width of 1883mm (6ft, 2in) between its handrails. Stylish picket aluminum fencing is 1070mm (42in) above the deck, running vertically along the bridge sides from floor decking upward, spaced closely together as a child safety feature. Stainless steel bridge anchors with 25mm (1in) threaded rods, fasteners, rivets, and screws secure the bridge onto its abutments. The bridge''s dead load including decking is 7 925 kilograms (17,435 pounds). 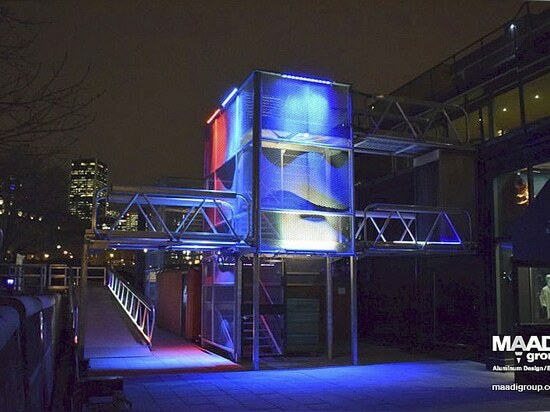 The pedestrian bridge''s aluminum structural components, chords, diagonals, transversals, stringers, handrails, aluminum fencing, and transition plates weigh 5 959 kilograms (13,110 lb) without decking, and 7 925 kilograms (17,435 pounds) with decking. MAADI Engineers designed thermal expansion joints at the bridge ends to enable the bridge to expand and contract up to 50.4mm (2in), allowing for a temperature gradient of 70 degrees, between -35°C and 35°C (-31°F to 95°F). The bridge''s camber clears a 5M (16ft, 5in) height by 6M (19ft, 8in) width double line roadway used for maintenance and vehicles that enter the stadium field for parades and special events. The bridge''s walking surface has a mean grade of 8 percent, varying from end to end to accommodate the vertical clearance needed for the roadway path below. The bridge handles light maintenance vehicles that, when fully loaded, weigh approximately 1 000kg (2,240 lb) each. 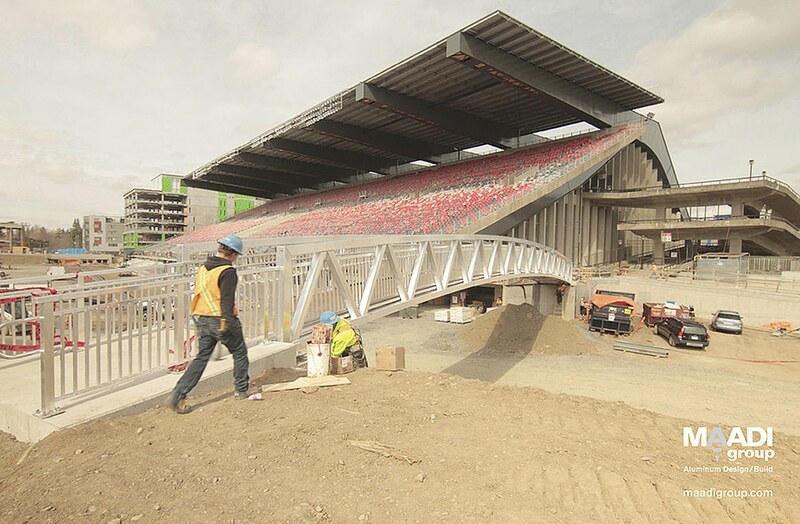 The TD Place Bridge was installed by 4 workmen and one crane operator in just 6 hours using a 110-ton capacity crane. 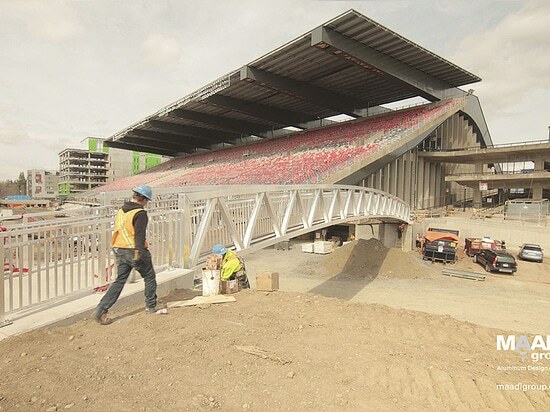 For more information, please visit www.maadigroup.com, or contact Alex: alex@maadigroup.com and view the TD Place Bridge Video! August 24, 2015 – MAADI Group, Inc., Engineering Design and Build firm of Boucherville, Québec, Canada has provided the Port of Sept-Îles, Québec, with two Make-A-Bridge® (MAB) aluminum pedestrian bridges, forming the main entryway into a new Port administration building (Photo courtesy of the Port of Sept-Îles). The building lobby displays the iconic Hermel boat, which Mylène Paquette rowed solo across the Atlantic Ocean, 1,300 kilometers from Halifax, Nova Scotia to Lorient, France in 2013. 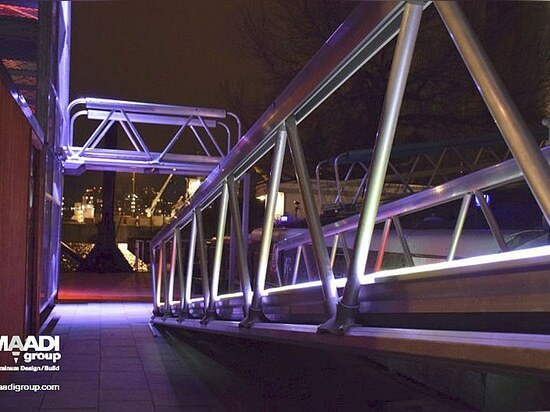 The two MAB footbridges, 20 feet and 26 feet long, create full access to the Port’s very popular exhibit. 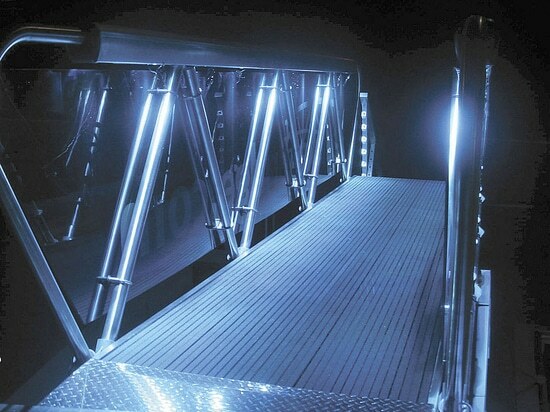 Each Make-A-Bridge® features: mill-finish corrosion-free aluminum; clear width of .9 meters (2.95ft) and height of 1067mm (42in); and live load capacity of 4.8kPa (100lb/pi2). 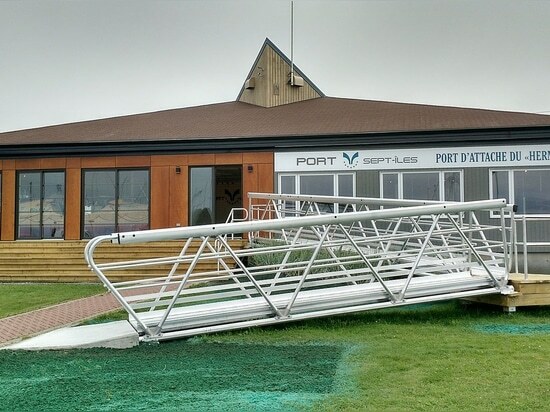 The Make-A-Bridge® structures enable access for all Port of Sept-Îles patrons and visitors, including those with disabilities.